Straven Guest House is a Victorian property that provides high quality bed and breakfast accommodation. 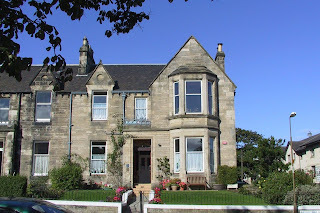 It is located in the leafy suburb of Joppa, Edinburgh. This is a peaceful area and only a 20 minute journey into the city centre. There is a wide selection available at breakfast time. The menu includes: A full cooked Scottish breakfast with fried egg, bacon, sausage, black pudding, tattie scone, tomato and mushroom. Scrambled eggs and smoked salmon served with organic bread. As well as this there is a buffet selection and option of traditional porridge to start. The meat and eggs are locally sourced. We make our own preserves. This lovely suburb of Edinburgh has a sandy beach which is perfect for paddle boarding and kite surfing.